The Ixon Space has the same even projection of light that the Ixon Premium and IQ Cyo premium have, but at full power is brighter at 150 lux. It's lithium battery charges via a Micro USB port. The lithium battery can serve as a "Power Bank" to charge other devices such as a GPS or mobile phone. The Ixon Space comes with two cables, both having Micro USB connectors at one end to plug into the Micro USB port at the rear of the Ixon Space. The port is protected by a rubber cover when not used. One cable has a standard male USB connector at the other end for charging the Ixon Space battery from any USB source, and the other has a female USB port for charging mobile phones or GPS devices. A charger with USB port is included, however its plug is the European style, so you'll need an adapter to plug into USA or Canadian wall outlets. We sell an inexpensive adapter. 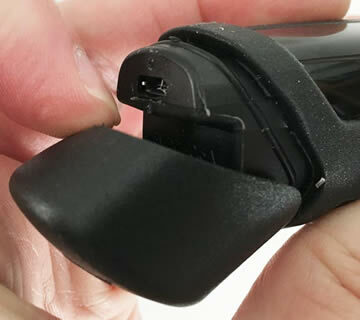 The single Micro USB port at the rear of the Ixon Space is used either for charging the Ixon Space battery or for charging your other devices. There are eight settings for brightness. Highest is 150 lux and the lowest is 20 lux. At 150 lux the run time is about 2.5 hours. At 20 lux the run time is about 30 hours. These run times are achieved after the battery has been charged and discharged about 5 times. 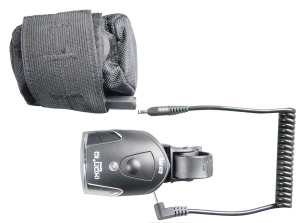 When used for charging other devices, the run times for the Ixon Space headlight are reduced. The highest power setting will be helpful to cyclists descending in hilly terrain, but especially helpful when riding in rain with lots of other traffic. Of course the Ixon Space comes with a handlebar mount. But you can buy an extra mount for a second bike. The wall charger included with the Ixon Space has plugs for AC outlets in Germany and other European countries. For North America you'll need an inexpensive plug adapter. We sell these. 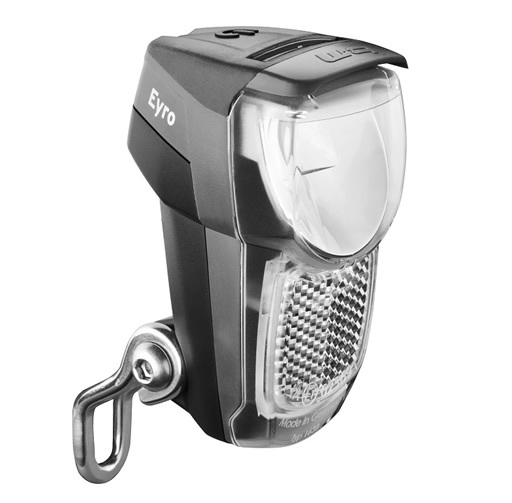 For 2016, Busch & Müller introduces the Eyro headlight. With the same great optics as the dynamo powered Lumotec Avy headlight, the Eyro is lithium battery powered, recharges via USB, and mounts on the fork crown. The main headlight housing is easily removed from the mount. So while your bike is parked in the bike rack with all those other bikes, the Eyro itself is safe in your office charging its battery from a USB port on your computer. 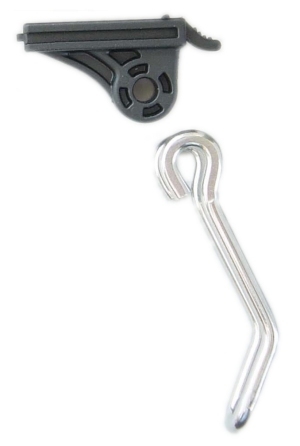 If you like, the Eyro can be locked to its base using an allen wrench. Note the hex head at the rear. The Eyro has the same 30 lux rating as the Avy headlight, and the Fyre headlight, just below. 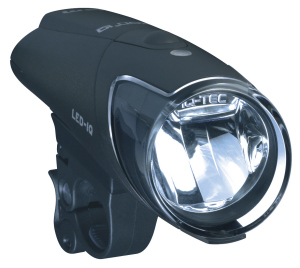 The 30 lux beam is bright enough for most conditions cyclists regularly ride in. It's particularly well suited for urban commuting, where your primary concern is being seen by automobile drivers, and seeing road debris and winter potholes. It's not recommended for fast descents down unlit roads in the mountains. At full power, 30 lux, the run time is 5 hours. At low power, 10 lux, the run time is 15 hours. You must use the headlight through a few charge cycles before you will get the full run times. The battery needs a bit of "exercise". 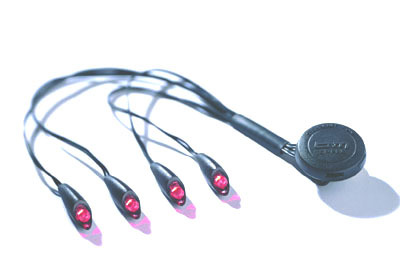 The Eyro ships with a USB Micro cable. For 2016, Busch & Müller introduces the Fyre headlight. 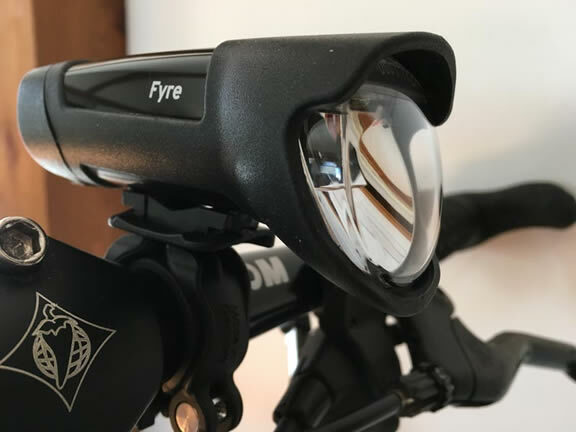 With the same great optics of the dynamo powered Lumotec Avy headlight, the Fyre is lithium battery powered, recharges via USB, and mounts on the handlebar. The Fyre is essentially the Eyro headlight, but designed for handlebar mounting. It uses the same lithium battery, same LED and optics. At the rear is a rubber cover. It keeps water out of the USB charging port. Pull back the rubber cover to expose the Micro USB port for charging the battery. The handlebar mount works with any handlebar diameter from 22mm through 31.8mm. 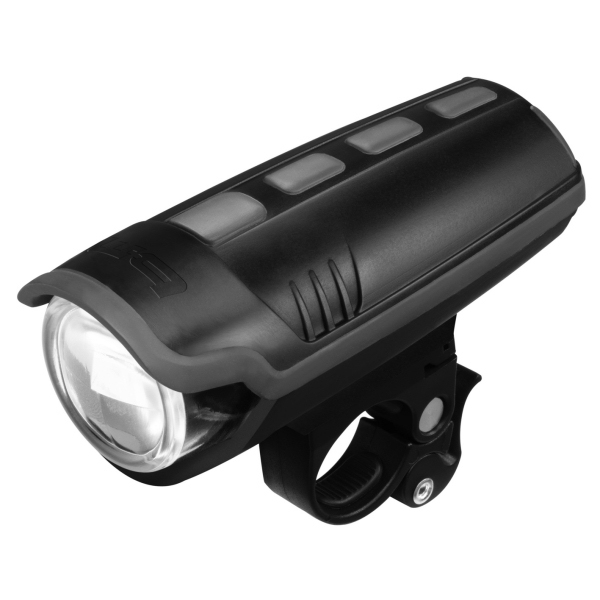 The 30 lux beam is bright enough for most conditions cyclists regularly ride in. It's particularly well suited for urban commuting, where your primary concern is being seen by automobile drivers, and seeing road debris and winter potholes, since there is usually overhead street lighting. It's not recommended for fast descents down unlit roads in the mountains. 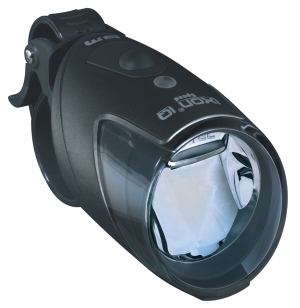 New for 2014, the tiny Ixon Core uses the same new optics as the Lumotec Eyc dynamo headlight. Power is from a lithium battery, which is charged via a micro USB port at the rear of the housing. This is a very bright headlight at 50 lux in its full power mode. 10 lux in low power mode. Run time in full power is 3 hours, low power is 15 hours. In many applications low power is all you need. The projected beam is brightest at the top, and is progressively dimmer towards the bottom. 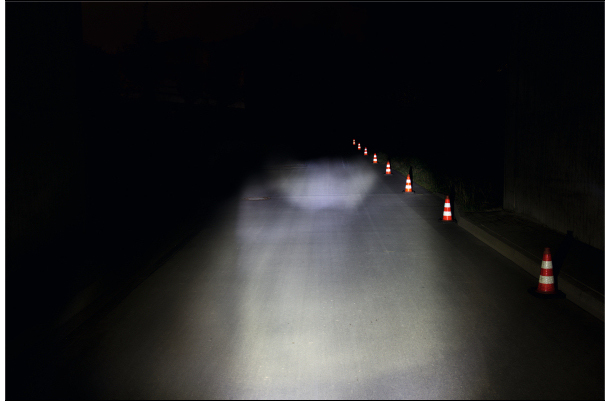 This results in amazingly even illumination of the road surface ahead, unlike so many other headlights you'll find in bike shops that are really just flashlights with a handlebar mount. Includes a cable to plug into any USB port for charging. We also have the Ixon Core packaged along with the IXXI taillight. Pronounced "icks-on". Very bright LED headlight with a wide beam, very even illumination of the road ahead. Powered by four NiMH rechargeable AA batteries. Can also be powered with alkaline AA batteries. 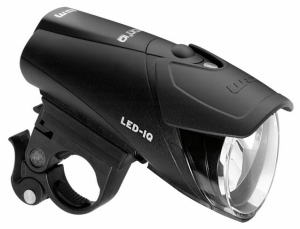 Focused beam of the Ixon IQ Premium is identical to the Lumotec IQ Premium Cyo. Sharp horizontal cutoff to the top of the beam to keep focused light out of the eyes of oncoming drivers. Shine the beam onto a vertical surface and you'll see that it is brightest at the top getting progressively dimmer towards the bottom so as to give even lighting to the horizontal road surface both close to you and far away, just like a high quality automobile low beam. Available without batteries, or with 4 Nickel Metal Hydride rechargeable batteries, and charger. Charger plugs directly into the headlight from below. No need to remove the batteries to charge them. The charger will not overcharge the batteries and won't attempt to charge non NiMH batteries. Charger designed for German wall outlets which use round plugs instead of the flat type we use in the US and Canada. A $ 3.00 adapter is required for the charger and we keep them in stock. You may already have the necessary adapter if you have a universal set of adapters for international travel. A small LED on top warns you when the battery power is getting low. Full power setting (80 lux) gives a 5 hour run time. Low power gives about 20 hours at 10 lux. Run times are for fully charged NiMH batteries. Full power is adequate as a standalone headlight for most cyclists in most situations up to perhaps 30mph for the IQ Premium. Low power is more than adequate for low speed riding, up to perhaps 15 mph on dark roads or bike paths. For urban cycling with overhead street lights, the low power setting is perfect. These are my estimates based on my own experience using this light. Everyone's night vision is different! Do your own tests and ride safely! 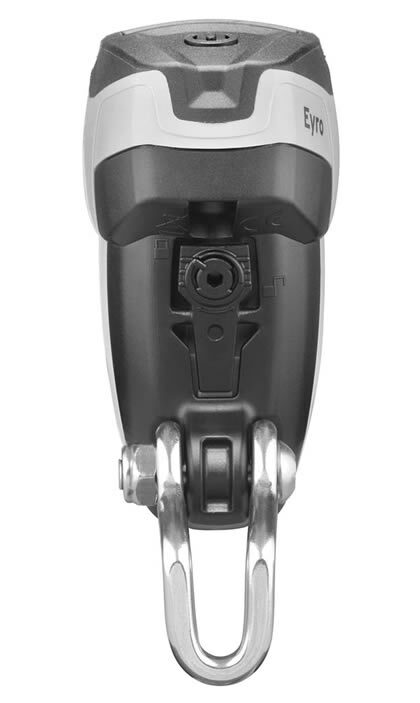 The Ixon IQ Premium is also the ideal backup for a dynamo powered lighting system. For a brevet rider using a hub dynamo, should there be a front wheel failure due to a crash, the rider may not be able to repair the dynamo wheel in time to complete the event. But any regular front wheel could be substituted if the rider has battery lights available. The Ixon IQ Premium is ideal since very few batteries need to be carried due to the long run time keeping weight and volume low. And with the Ride & Charge and a hub dynamo, you can keep your batteries fully charged while you ride. See below. The Ixon IQ Premium includes the handlebar mount which is adjustable for all round handlebars up to 31.8mm diameter. Extra mounts are readily available. As of November 3, 2010, every Ixon we ship with NiMH batteries has had the batteries charged once and tested. NiMH batteries only deliver their full run times after they have been charged and discharged several times. So you must plan ahead. Don't expect a new set of batteries to give you full run time after the first charge. Busch & Müller lights powered by AA batteries can use up 1.6 volt batteries. The rechargeable NiMH batteries, what in Germany are called "accus" are 1.2 volts. Do not use AA batteries rated at higher than 1.6 volts, such as lithium ion. These can damage the electronics. 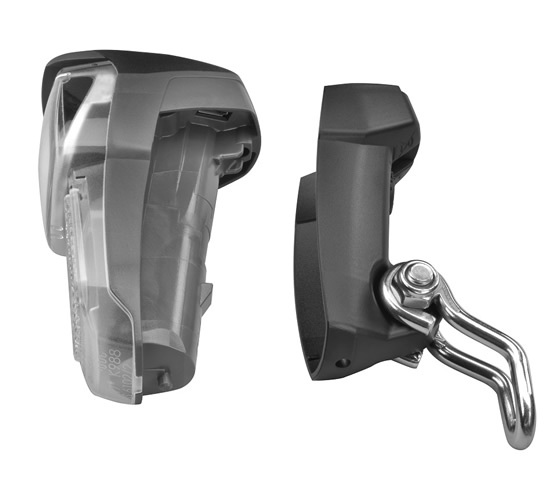 Additional handlebar mounts are available for conveniently using one light on more than one bike. Just keep an Ixon IQ mount on each bike and only transfer the Ixon. 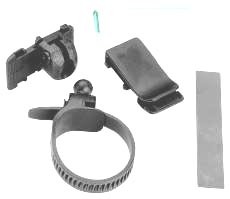 This two part mount consists of the stainless steel mount for the Lumotec IQ CYO headlight, and a plastic base that replicates the connection for the handlebar mount. So you can quickly move the Ixon IQ from one bike with a handlebar mount, to another bike at the fork crown. The fork crown mount for the Ixon IQ Speed headlight works well for the Ixon, but only if you use the older Ixon mount. See below. Don't use wireless cycle computers! Some lights can interfere with the signals between the wireless computer sending units and the computer heads. Wired computers never have these problems. Since I get a great deal of conflicting data concerning which lights and which wireless computers have these issues, the only constant I can point to is the wireless computer. If you only use wired computers, you'll never have an issue. New for 2011, Busch & Müller offers a glare protector for the Ixon, Ixon Speed, Ixon IQ and Ixon IQ Speed. If you're standing on the pedals during a climb, light from the headlight may be bothersome since your eyes are now over the handlebar and therefore above the headlight. 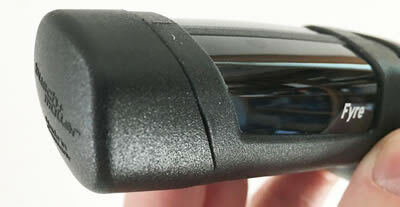 The glare protector is a piece of molded rubber that attaches to the top of the light housing with two adhesive pads. The Ixon IQ Premium now ships with a Glare Protector included. Charge the batteries from a dynamo? You can use the Busch & Müller E-WERK to charge the NiMH batteries in the Ixon IQ and Ixon IQ Premium headlights. You will need a special cable. It's the same cable as used to connect the Ixon IQ Speed to its battery. Comes in two lengths. If you don't have an E-WERK, you can use the Ride & Charge. It connects to your 6 volt-3 watt dynamo in line with your dynamo headlight. Cable to the Ixon headlight plugs into both the headlight and the Ride & Charge disconnecting the dynamo headlight and providing full power to charge the NiMH batteries in the Ixon. The Ultimate Battery Powered Headlights are In Stock! Busch & Müller's latest LED headlight. Brighter than the Ixon. 98 grams without battery. Separate NiMH battery pack. One or two headlights can be attached to the battery pack. Adjustable mount fits all diameter handlebars. An optional helmet mount is available. 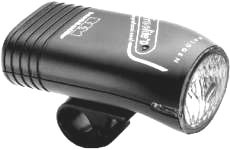 This is my best battery powered headlight for a commuting cyclist. Since it must be used with its proprietary battery pack, it's not the best option for the touring cyclist, who may need to use hardware store batteries in a pinch. But the commuter always knows how much run time he'll need for the commute, and the Ixon IQ Speed has a wonderfully big and bright beam that should get the attention of every other driver on the road, and give you a great view of what's ahead. If running two headlights, the run times are cut in half. 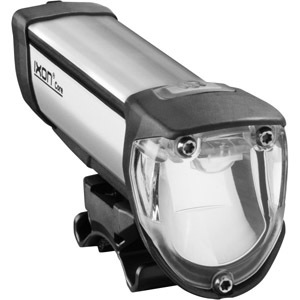 Like the Ixon IQ and other LED and halogen headlights from Busch & Müller, the Ixon IQ Speed has a beam that is brightest at the top, and becomes progressively dimmer towards the bottom, which makes the road ahead of you evenly lit, the further distance receiving more light than the road close to you. No focused light reaches the eys of oncoming automobile drivers, so they aren't likely to turn on their high beams. You aim the light so that the bright top part of the beam hits the road just below the horizon, giving you an excellent view of the road ahead. System comes complete with one headlight with built-in handlebar mount, battery pack, and battery charger. The battery pack measures about 1.5" x 2" x 3", is held in a nylon fabric pouch, and straps to the frame or the stem with velcro. Battery recharges in 6 hours. A Secondary Ixon IQ Speed is available which plugs into the same battery, giving you twice the light, at half the run time. You can get it with just the handlebar mount and cable, or with a helmet mount and head strap as well. 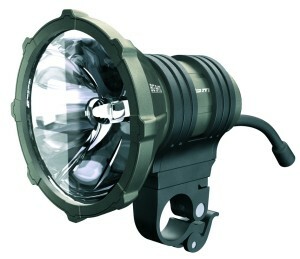 It's hard to imagine needing a brighter light than one Ixon IQ Speed. But by having two, you can aim them side by side, giving an extremely wide patch of light on the road ahead. Even in low power mode, the lights are quite bright, so many riders may only use full power for a fast descent. The beam is easily adjustable side to side and up/down while riding. 10 hour run time at high power, 50 hours at low power for both versions. The new (fall 2013) Ixon IQ Speed Premium beam is so bright and wide I see no reason to consider using two of these. You'll also need a plug adapter for US and Canadian wall outlets. New for 2011, Busch & Müller offers a glare protector for the Ixon, Ixon Speed, Ixon IQ and Ixon IQ Speed. Shown here mounted to the Ixon IQ. If you're standing on the pedals during a climb, light from the headlight may be bothersome since your eyes are now over the handlebar and therefore above the headlight. The glare protector is a piece of molded rubber that attaches to the top of the light housing with two adhesive pads. Available now, the Ride & Charge (R&C) can charge the batteries in the Ixon and Ixon IQ while you ride, if you have a hub dynamo like the SON, Shimano or SRAM, or a sidewall dynamo like the Dymotec 6 or Dymotec S6. 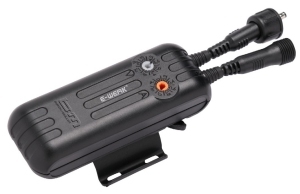 You can also use this device to charge any NiMH AA batteries while you ride your bike, provided you have the dynamo and the Ixon headlight. When discusing the Ride & Charge, any mention of the Ixon applies equally to the Ixon IQ. This makes the Ixon headlight an even better choice for people riding brevets or on extended tours. Use a dynamo lighting system as your primary riding lights. Have the Ixon available for times when you want more light, such as a fast descent or high traffic. The Ixon gets charged during the day, and is also available as a general purpose flashlight while you're at your campsite, or fixing a flat on a brevet. Using the Ixon at low power gives you a 13 hour run time flashlight, more than enough for reading in the evening. The Ride & Charge is in stock. It consistes of a small black plastic box, about the width of a fork blade, some wire, and a rubber O ring to lash it to your fork. If you mount it behind your fork, you won't see it from the front, and from the side, it might make people think you have a wireless computer sensor mounted. Two wire leads run from your dynamo to the R&C. Another two wires run from your dynamo headlight to the R&C. When connected, your dynamo lighting system works normally. It has no effect on your dynamo lights, regardless of the particular configuration of your dynamo lights. For example, whether or not you have a Secondary headlight, or a taillight, the system is unaffected by the R&C. There's also a female plug on the R&C. That's for connecting the Ixon. When you plug the provided wire into the Ixon, and into the R&C, the dynamo's current is diverted from your dynamo lights to the Ixon's batteries. Now, the dynamo lights will not work. Plugging in the Ixon turns off power to your dynamo lights. There's no way to have your dynamo lights running, while at the same time you are charging batteries in the Ixon. But the Ixon can be turned on while its batteries are being charged. The charging time will be longer though if you have the Ixon switched on while charging its batteries via the R&C. Keep in mind, if you want to run with the Ixon while charging its batteries, if your taillight is dynamo powered, it won't be on. So if you want the flexibility of using either your dynamo lights or the Ixon, powered by the dynamo, you'll also want to have a battery powered taillight. One convenient way to handle this is to use the Busch & Müller 4DToplight Senso Multi taillight. It takes AA batteries, but also can be powered by a six volt dynamo. So you can switch from powering your dynamo lights to powering the Ixon, and the taillight will automatically switch over to battery power when the bike is moving and the dynamo isn't powering the taillight. You can only charge NiMH batteries in the Ixon with the R&C. Rain will have no effect on the R&C, provided it's aligned properly, in accordance with the English language directions as supplied. Excruciatingly (Nauseatingly?) Important Legal Notice! In other words, if you are wondering whether or not you can use the Ride & Charge with some other combination of lights and power sources, the answer is, I have no idea. If you try it, and it blows up with the force of a twenty megaton newcueler bomb, don't blame me. When the R&C was first introduced, I thought that it was not compatible with sidewall dynamos. This has been proven to be incorrect. The Dymotec 6 and the (now discontinued) Dymotec S6 have been tested with the R&C and work properly. I have not tested the Ride & Charge with any other sidewall dynamos, but my guess is that any six volt bicycle dynamo will work. And of course it works perfectly with the SON dynohub, as well as any current Sanyo or Shimano dynohub. Click here to download the R&C instructions as a PDF. If you only need to charge the batteries in an Ixon or Ixon IQ, the Ride & Charge is all you need. But if you want to charge the batteries in other gizmos, like a PDA, a cell phone, iPhone or GPS, or even the batteries of a Big Bang or Ixon IQ Speed, you'll need something a bit more sophisticated. Click here for the E-WERK by Busch & Müller. The Ixon Pure is powered by 3 AA NiMH batteries, and is charged via a Micro USB port on the underside. Leave the batteries inside and plug in from either your computer, or from any USB source. You can buy the Ixon Pure with or without the batteries, a USB cable, and a wall plug charger that is a USB source. The wall plug is for European wall outlets, so you'll need a $3.00 adapter to use it in the US or Canada. The supplied mount is for 26mm and smaller handlebars, and it's ideantical to the Ixon mount. We sell a mount for oversized handlebars. The Ixon Pure is quite bright at 30 Lux. It projects a bright rectangle of light at the top of its beam, and a dimmer area at the bottom, so the road at a distance gets plenty of light, and you can still see the road close to the bike. 3.5 ounces without batteries installed. Run Times: High Power - 5 hours, 30 Lux. Low Power - 15 hours, 10 Lux. On a dark country road without other traffic, 10 Lux is plenty, unless it's raining. In the rain, you'll want 30 Lux. And in the rain, the Ixon Pure will not be affected by water. It can rain on the headlight all day long. Any water that gets inside can drain out through a hole in the bottom. The Ixon Pure must be used right side up, both to allow moisture to drain, and for the beam to project properly on the road surface. Don't take the Ixon Pure with you when you swim the English Channel; but it's fine in the Indian monsoon. Buy the Ixon Pure with charger, USB cable and 3 AA batteries, or buy just the Ixon Pure and supply your own batteries. You can use any USB charger. Charging time with the supplied B&M batteries is 5 hours when those batteries are fully depleted. Busch & Müller lights powered by AA batteries can use up 1.6 volt batteries. The rechargeable NiMH batteries, what in Germany are called "accus" are 1.2 volts. Do not use AA batteries rated at higher than 1.6 volts. These can damage the electronics. The Ixon Pure Basic looks the same as the Ixon Pure, but is not quite as bright and has no provision for charging batteries within the light. In other words, it does not have the USB port. You must remove the batteries in order to charge them. It comes with no batteries, but takes 3 AA batteries. 15 Lux output, and same good beam pattern as the Ixon Pure. We no longer sell the Big Bang. But we do have replacement battery packs and chargers. The first gas discharge light with German StVZO approval for bicycles. The Big Bang is incredibly bright and has a 4.5 hour run time on a rechargeable lithium ion battery. It can be mounted either above or below the handlebar. It's completely waterproof. The beam meets the German StVZO regulations for bicycle lighting, and it ships with a special diffuser, the "Offroad Fluter" for riding off road, where a symmetrical beam is preferable. Unlike other gas discharge headlights, the Big Bang won't blind oncoming drivers since the beam can function like a high quality automotive low beam. This makes it suitable for road riding, since all of the focused light is on the road rather than into the oncoming driver's eyes. Who else but Busch & Muller would think to make this extremely bright lighting technology safe for use on roads? But the beam can also become symmetrical, like an automotive high beam, providing a large beam for lighting up the woods! 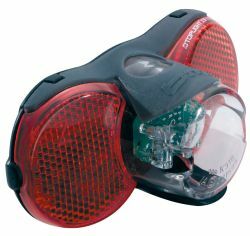 Other gas discharge bicycle lights are, in my opinion, dangerous for use on the road. With these other lights, an oncoming driver sees an extremely bright light that is focused into his eyes, just as if an automobile were approaching with its high beams on. But when used on the road, the Big Bang can be set to act like an automotive low beam. And so the Big Bang will not be dangerous for road riding, since oncoming drivers will be able to see ahead just as easily as they would if an automobile were approaching with its low beams on. When you're in a car with good quality low beams, and another car approaches with its low beams on, you can see the road ahead very clearly, because light from the low beams isn't being focused into your eyes. Those low beams are still very bright, but the light is only being focused onto the road. It's the same with the Big Bang. And just as you can clearly see that a car with low beams on is approaching, an automobile driver who sees your Big Bang will know that you're approaching, just as if you were on a motorcycle (you'll have only one beam). Separate Lithium Ion battery pack. Battery recharges in 3.5 hours. Check back for more details. Voltage Converter: $ 12.00 This converter takes the German plug of the Big Bang charger, and it plugs into a standard American/Canadian wall outlet. You don't need a plug converter with this voltage converter. It's all you need to charge the Big Bang. Uh, well, you also need those magic electrons from Niagra Falls, or elsewhere. 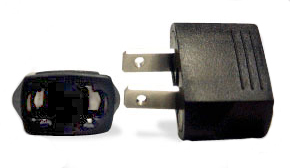 Adapter (no voltage conversion): $ 3.00 Use this if you already have a voltage converter but no plug adapter. The Freelite D is no longer made, and I no longer have any for sale. However, I still stock replacement bulbs for this very nice halogen headlight, and as long as Busch & Müller continues to make replacement bulbs, I'll continue to stock them. And of course we also have NiMH AA batteries for this headlight. All of the taillights we sell, without exception, use LEDs. We sell no taillights that use bulbs. And we don't sell replacement bulbs for taillights that use bulbs. Taillights with bulbs make little sense these days since LED taillights are so much brighter and reliable. For headlights bulbs make sense since they can be focused so easily. But taillights don't require precise focusing of the beam, so an LED is much better. These battery powered taillights all attach to the back of a rear rack, like the Tubus Cargo. If your rear rack doesn't have the appropriate mount, we have brackets that will enable you to use these taillights on most rear racks, or even a seat post binder bolt. See the light mounting page for pictures of these brackets. Scroll down towards the bottom of that page for the taillight mounts. These taillights look just like our dynamo powered taillights, and mount the same way. With most of these taillights, you can choose to place thej mounting bolts at either 50mm or 80mm width. The exception is the Toplight Line model, which comes from the factory with bolts at 50mm, and can't be changed. Since I don't know of any rear racks sold in the US or Canada that take 80mm bolt spacing, but not 50mm bolt spacing, this shouldn't be a problem. For example, some Tubus racks can take either 50mm or 80mm, and others only take 50mm. 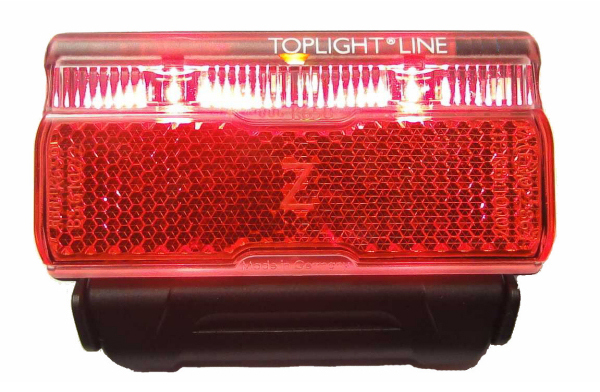 LineTec spreads the light from two LEDs across the width of the taillight. Powered by a single AA battery. 2 position "On/Off" switch. 50mm bolt spacing fits Tubus and many Topeak racks without an adapter, and most other racks with optional adapters. Same as above but with a three position switch: "On/Off/Senso". The Senso position enables the light and motion sensors in the taillight. When the bike is moving and it's dark, the light is automatically switched "On". When you stop, the light stays on for a few minutes, and as long as you don't move again, it switches off and stays off. The "S" version adds Busch & Müller's "Line Tec", a series of reflectors that spreads the light from the central LED across the width of the taillight. And don't worry, the vertical bars glow red. They're just overexposed in this photo. Also, the photo is of the dynamo powered version, and shows the connectors at the bottom. On the battery version, there are no connectors, but there is an "On/Off" switch on the bottom right side. About 18g including the battery, the 4 LED flashing signals are too light to be even felt. Attaching in seconds, the tiny self-adhesive LED casing can be attached to rear or lateral ventilation orifices of the helmet. 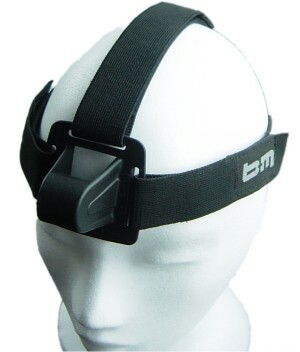 The thin, flat cables can be easily routed to the chin belt via the inner helmet surface to connect to the flat, round cell housing with on/off button that is attached by clips or adhesive strap. All Busch & Müller products have a one year warrantee against manufacturing defects from the date of purchase. Don't use wireless cycle computers! 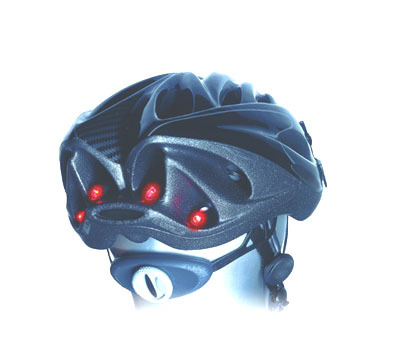 Some bicycle lights can interfere with the signals between the wireless computer sending units and the computer heads. Wired computers never have these problems. Since I get a great deal of conflicting data concerning which lights and which wireless computers have these issues, the only constant I can point to is the wireless computer. If you only use wired computers, you'll never have an issue. Also, why use up batteries with wireless computers? A wired computer only requires one battery, which is environmentally superior. 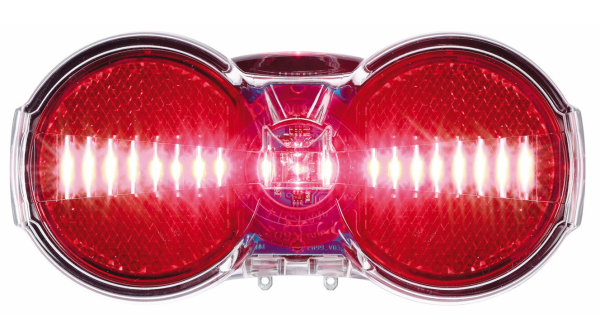 If you have a retail bicycle shop, or are a bicycle manufacturer, you can purchase Busch & Müller products, including dynamos, headlights, taillights, battery lights and mirrors at wholesale prices for resale. Any shop in the US or Canada can purchase Busch & Müller products for sale in your store. Please call me for pricing. Peter White Cycles is an official representative for Busch & Müller in the US and Canada, and we want all bicycle shops to be able to sell these products.